The boy's behaviour...: Bananas are stupid, and so is mummy! Today we’ve had a few plans – nothing major, but things to do – a quick trip to the post office, then a whizz around Morrisons, before getting home to wait for Nanna and Grandad, who were kindly coming over to mow and tidy our back lawn. I hadn’t mentioned to Mini that Nanna and Grandad were coming, I’d told him that we needed some nice things for lunch because 'visitors' were coming, and that because he knew so much about food, I really wanted him to help me choose which nice things to buy. All went well, he didn’t even craze me for sweets! Nanna and Grandad arrived and Mini was really pleased to see them. He asked if he could help in the garden and watch, so whilst Nanna and I had a catch up, Mini helped Grandad, then Nanna joined them later. Lunch was peaceful, then Mini chose a game to play which Dollop tried to join in with, and I tried to get the hang of with the ‘help’ of the instructions. Nanna and Grandad had to leave so didn’t play and bid their goodbyes. Within 5 minutes of them leaving, Mini had enough of the game, and demanded (with foot-stamping) more food. I quietly told him that – as always - he could help himself to fruit. Given that the game had been given up and fruit had been offered, I went to wash up the lunch plates quickly, returning to find Mini attempting to destroy the living room rug by pulling holes in it, and urging Dollop to help. After telling him to stop, he immediately tantrums and starts shouting (at 3.10pm) ‘what’s for dinner, I don’t want stupid fruit, I hate fruit, you’re stupid because you know I hate fruit, especially stupid bananas, they are the stupidest and so are you mummy’. Of course bananas are Mini’s favourite fruit and this is all probably a reaction to me not offering a biscuit which is the desired snack, as is the attack on the poor innocent rug, along with him being cross that Nanna and Grandad left. Getting Dollop to help is a major bonus – he’s never had a co-conspirator before! I offered Mini a hug – but they’re stupid too. I gave him a hug anyway. Now next week we’d been hoping that Mini would go and have a night at Nanna and Grandad’s house. They love having him, he enjoys going. He’s good perfect whilst he’s there. After such good behaviour yesterday and today, I said to Nanna that I felt Mini would be fine. But now I’m wondering – if we have this kind of meltdown after just a few hours, what’s he going to be like after an over-nighter there…. We’ve fine-tuned some things to make it easier for Mini and me…they now come here to pick him up and drop him home, else he would always meltdown when I picked him up from their house. Now he meltdowns mostly the next day, it’s the same sort of reaction that we had on Sunday after a nice visit to friends the day before. It’s the same reaction that we see whenever we do anything, go anywhere, see anyone. He will still go to Nanna and Grandad’s for a sleepover, he’ll love it, they’ll love it, and I’ll just gear myself up for problems the next day. Please remember though, if you see us, Mini might appear fine, and you might think we're making all of his issues up - but really, inside he's hurting and anxious and the only place he really feels safe enough to let those feelings out is here, at home with us, and because he's just 5, the only way he knows how to express those feelings is to either be naughty, or tantrum (but an extreme tantrum). So bear in mind that if you invite us out and we turn you down, it's not because we don't want to see you, it's probably because we haven't got the energy to deal with the fallout later or the next day, or because we don't like seeing Mini have multiple meltdowns and getting upset, or because we want to avoid the punches and kicks we get as a result of those meltdowns. Every bit of parenting seems to be a balancing act and a long list of trade offs. Enjoy your night off and I hope the fallout is not too awful to spoil your night off. Sounds familiar. It is like a huge balancing act. I've just left Bonzo for a sleepover at my brother's - am already anticipating the reaction tomorrow when I collect him. Meanwhile, I'll enjoy the peace, knowing he is having a great time! 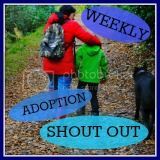 You obviously need to come to your own conclusions about whether adopting is right for you or not, but I will say you'll probably find lots of negative stuff online (and info about the harder side like this blog) because no-one brags about the good days, only the bad ones when we need support. But there is a great twitter community of adopters, and some other great bloggers out there. Today we're having a good day - no triggers to set the bad stuff off. The kids have played nicely together, they've argued, we've been out and it was lovely, we feel like a normal everyday family today. I really hope things move forward positively for Mini, and already just knowing that we're getting a bit more help now is making me feel brighter about things and I'm sure I've been a better mummy recently for it!